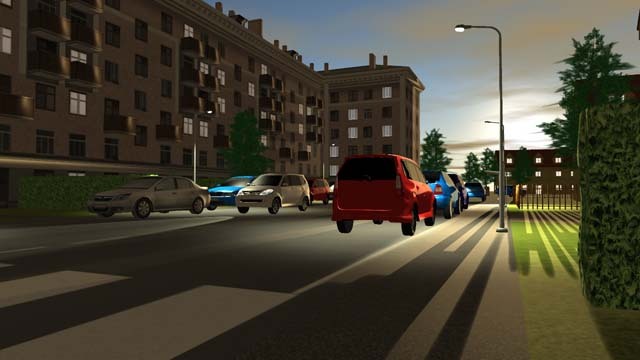 StreetSmart™: road safety training in a realistic virtual environment. Phenomatics, in collaboration with the Land Oberösterreich has developed StreetSmart: a ground-breaking simulation of a suburban street scene. Realistic and absorbing, it is for use by children under supervision of adults, to help them understand the dangers from road traffic and learn road safety procedures. The simulation presents the child with choices on how to act and react safely in a busy street. Owing to the young age of children involved, Phenomatics opted to develop StreetSmart as laptop-based, with visualization on the computer screen rather than via a headset, and navigation via mouse and keyboard. As a first-person simulation, the child is free to move around and explore the virtual environment of the sidewalk and street. As in real life, individual cars and trucks react realistically to the presence of the child. This is a stimulating and life-like experience for children, contributing to high learning effectiveness. The situation can be varied in an endless variety of ways: traffic speed and frequency, time of day or night. Endless combinations of weather, visibility, and daylight, affecting both the pedestrian’s and the driver’s ability to see and react. Used particularly under adult supervision, lessons on safe behaviour can be immediately simulated, with the aim of increasing street competence. Correct behaviour is reinforced. The graphically-realistic and interactive properties of this simulation are familiar to very many children from video games.